The Art Department at Wabash College is excited to announce its first exhibit of the spring semester. Brad Bernard will show "Blues Routes" in the Eric Dean Gallery from January19 through February 20 with a public reception 8-9:30 p.m. on Monday, January 19. Blues Routes is an exhibition of candid portraits documenting and honoring traditional Mississippi hill country, delta blues, and gospel musicians of Bernard’s acquaintance. These narratives are casual portrayals of individuals, which are superimposed over a patchwork quilt-like background derived from road maps and symbols that "emulate geographic location and or events relevant to the subject." 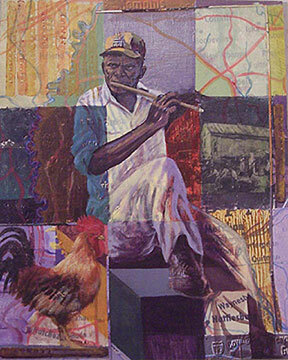 His mixed media collage paintings are influenced by Gee’s Bend and other African American quilts and plays upon theme of quilts as maps with references to freedom and to home. By incorporating maps, Bernard notes that most "Blues musicians return home" after they establish public recognition. Bernard previously served as a visiting professor of art at Wabash College. He gained familiarity with his subjects during the seven years he lived in Mississippi.